More than 13 years after a residential exemption was first proposed, the Selectmen are (finally...) looking into it. According to the latest information from Lexington’s Assessors, 14 communities in Massachusetts offer a “residential exemption” under Massachusetts General Laws Chapter 59, Section 5C: Barnstable, Boston, Brookline, Cambridge, Chelsea, Everett, Malden, Nantucket, Provincetown, Somerset, Somerville, Tisbury, Waltham and Watertown. These 14 communities represent 18% of all Massachusetts residents. A Town can adopt a residential exemption (of up to 20% of the median home assessment in Town) by a simple vote of its Board of Selectmen. Here is how the residential exemption works. If Lexington had a $100,000 residential exemption, $100,000 of value would be deducted from the assessed value of EACH owner-occupied residence BEFORE its taxes are computed. An owner-occupied house assessed at $500,000 would pay taxes as if it was assessed at $400,000; an owner-occupied house assessed at $2,500,000 would pay taxes as if it was assessed at $2,400,000. 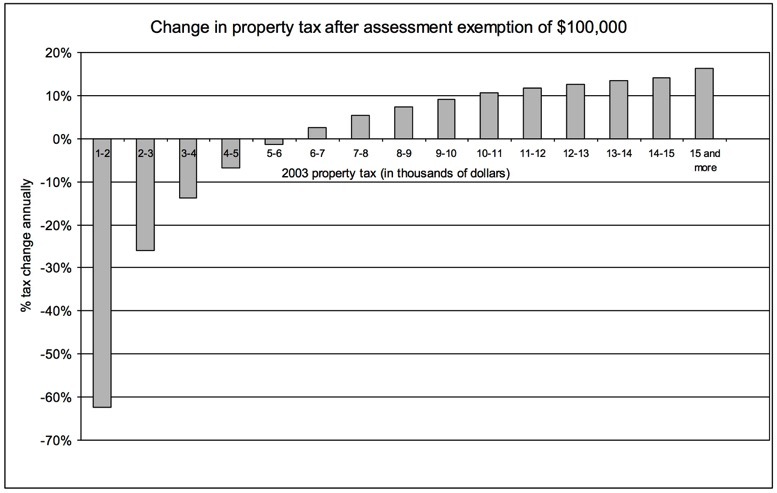 Because the flat $100,000 exemption is a much higher share of the assessment of a “small” house than of a “large” one, the net effect is that “small” houses would pay less in taxes, and “large” houses would pay more, the Town overall still collecting the same total amount in taxes (called the tax levy) from all taxpayers. In short, a residential exemption would make our real-estate taxes more progressive, shifting part of the tax burden (and more of it the larger the residential exemption is) from “small” to “large” houses. This is a fair thing to do if we want to keep Lexington diverse and affordable, since owners of “large” houses are statistically more likely to be able to afford higher taxes than owners of “small” houses. As the red box below shows, Lexington is fast becoming less and less affordable, and therefore less diverse. 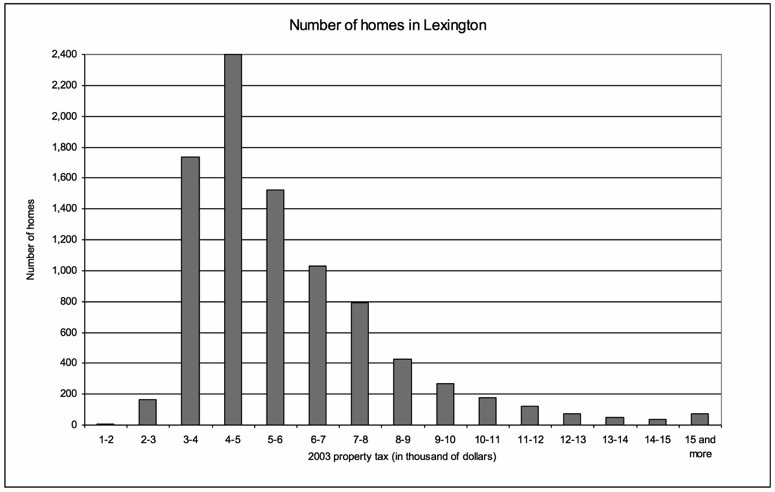 In 2010, 13% of all Lexington houses were assessed above $1 million, or 1,144. 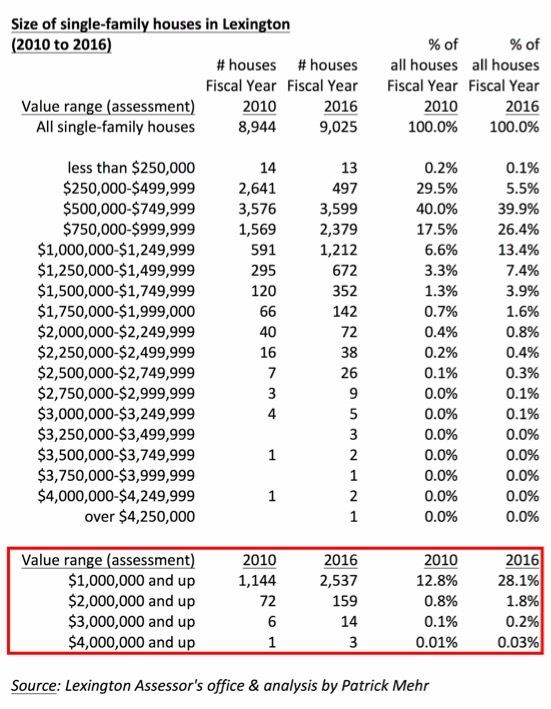 In 2016, 28% of all Lexington houses, or 2,537, were assessed above $1 million, more than double the number in 2010 and the number of $2 million plus houses has also more than doubled in 6 years, from 72 to 159. A residential exemption would make owning a very large house more expensive tax-wise than today, and would give our seniors (who overwhelmingly live in small houses) a tax break, helping them stay in Lexington. ----(ii) some “house-rich, cash-poor” people would be adversely impacted — but common sense suggests that we have far fewer “house-rich, cash-poor” people in Lexington than people of limited financial means living in “small” houses who would greatly benefit from the tax cut a residential exemption would give them (perhaps allowing them to stay in Lexington, which in turn would slow down the rising school enrollments we are seeing). A residential exemption, which 18% of Massachusetts residents already enjoy, should also exist in Lexington to cut taxes on “small” houses and raise them on “large” ones before all residents are asked to increase their taxes. More than 13 years after a residential exemption was first proposed, the Selectmen are (finally...) looking into it.